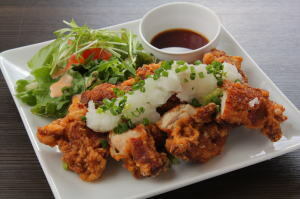 Tori no Karaage Oroshi Ponzu ('鶏の唐揚げおろしポン酢', is classified into deep-fried food), is known as Deep-fried Chicken with Grated Radish and Citrus Sauce in English, and 萝卜泥橙醋炸鸡 (Luóbo ní chéng cù zhá jī) in Chinese. Chicken, Ginger, Garlic, Soy Sauce, Wheat Flour, White Radish, Citrus Sauce. Green Spring Onion, Potato Starch, Sake , Mirin , Sugar, Lemon. Tasty (Salty, sweet, and sour).